What It's About (from the book jacket): Pearl has always dreamed of hunting whales, just like her father. Of taking to the sea in their eight-man canoe, standing at the prow with a harpoon, and waiting for a whale to lift its barnacle-speckled head as it offers its life for the life of the tribe. But now that can never be. Pearl's father was lost on the last hunt, and the whales hide from the great steam-powered ships carrying harpoon cannons, which harvest not one but dozens of whales from the ocean. With the whales gone, Pearl's people, the Makah, struggle to survive as Pearl searches for ways to preserve their stories and skills. Opening Lines: "I don't need my eyes to tell me what's coming, and I don't need my great-granddaughter's hand on my elbow to keep me from stumbling. I know my way to the beach. For eighty-nine years, these feet have known the land of my tribe. I won't fall now. Not today. Not after waiting so long." Why I Liked It: I have to admit here that Rosanne Parry is a real-life friend of mine. We are in the same critique group in Portland, Oregon, and she has been a huge mentor to my writing. That said, I was not a member of the critique group when Written in Stone was first written, so I did not see its genesis. I can truthfully say however that Rosanne worked on the story for years--ever since she started her teaching career in Taholah, Washington, on the Quinault Indian reservation, and the story is very dear to her heart. The story is framed by the resumption of whaling for the Makah people in 1999--which is referred to in the opening lines quoted above. We learn that Pearl was a girl of thirteen when the Makah voluntarily gave up whaling in the 1920s, and the bulk of the story is concerned with her as a young girl, coming to grips with the deaths of both her parents. "The drums faltered and fell silent. The welcome song waited in my mouth. Seven silhouettes bent over their paddles. There was no shout or raised arms, no trail of seabirds and sharks. Grandma counted, "Pau, saali, chakla, muus..." She wept before she came to seven. I did not count. I knew where the harpooner sat. My body held still as stone, but my mind flew out over the ocean like a seagull looking north and south, crying in a gull's one-note voice. Just as she did in her celebrated debut, Heart of a Shepherd, Rosanne Parry's writing sweeps the reader along. She also has an unerring ability to pull on a reader's heartstrings without being mawkish. Other things I liked: the strong family structure of the Makah, and the number of strong women in Pearl's life, particularly her Grandmother and her Aunt Susi, who show her the way forward. The historical details are well-woven into the narrative, so that they come up seamlessly--particularly the 1918 influenza epidemic which killed Pearl's mother and baby sister, the dealings with the Indian agent--"The Mustache"--who goes on "for many sentences, dishonoring us with the free use of a dead man's name," and the suspicious "art collector," Mr. Glen, who is really focused on surveying the Makah land for oil. 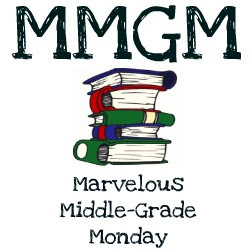 1) Who are your favorite (middle grade) writers? Well, I happen to be having tea with 3 of my favorite middle grade authors today, Susan Blackaby (Brownie Groundhog and the Wintery Surprise--okay this is a picture book but she also writes for older readers), Heather Vogel Frederick, (the Mother-Daughter book club series) and Susan Fletcher (The Falcon in the Glass). I am a lifelong fan of Beverly Cleary and a brand new fan of debut author Robin Herrara (Hope is a Ferris Wheel). And that's just the Portland authors I like! Obviously I could go on and on. 2) What's on your nightstand now? I met Luis Alberto Urrea at the Summer Fishtrap Workshop this year, so I've just finished his book Into the Beautiful North, which is lovely. Against all the noise of border-crossing children you hear in the news, it was a refreshing look at the issue from the migrating child's point of view. Besides that I have a bunch of books about wolves for a non-fiction project I'm working on and a really fun reference book called Home Ground which is a series of descriptions of natural features of North America as described by poets and writers of literary fiction. It's surprisingly fascinating. For example, when a tree falls over and heaves its root ball out of the ground, the depression left behind is called a tree tip pit. Cool! I really like the scene where Pearl discovers the petroglyphs. I love the way art tends to encourage reflection and meaning-making, so this was a great way for my character to have an encounter with a work of art and gain an insight into her own life's purpose. It took a lot of research to make sure that the scene would work, but I'm very happy with how it came out. Making jam. Using up fruit is a bit of a game at my house. We have apple, plum, peach and pear trees, plus blueberries, raspberries and loganberries. Last week I made lavender peach jam and plum sauce. Next, raspberry jam, and then pear chutney and caramel apple butter. 5) My favorite breakfast is..
At the moment I'm very fond of blueberry pancakes because the blueberries in my yard are ripe. 6) If you could visit any place, where would it be? Gosh, any place at all? Hmm. I'd love to take my family to all the great national parks in the US. I'd love to just pack up the canoe and the camping stuff for the whole summer and drive to Glacier, Yellowstone, the Grand Canyon, Yosemite, the Redwoods, the Everglades, Denali, the Smoky Mountains, Arches, and the Volcano Park in Hawaii (okay that would be a challenge to drive to). How about you Mike? Do you have a favorite national park? Me: Well, Rosanne, I hate to admit I have only ever been to Yellowstone.Several years ago, I was traveling back from the midwest with my sister-in-law, who had just completed medical school in Wisconsin, and I thought that riding shotgun with her and her belongings would afford me a wonderful way to see the country. However, I made a serious faux-pas in Yellowstone because of the British pronunciation of the word geysers. In Britain, we call those hot water spouts "geezers." So, when I loudly exclaimed in front of Old Faithful and the surrounding geysers, as well as the motor coaches disgorging bands of senior citizens, that I had "never seen so many geezers," I got a whole bunch of dirty looks. Oops! About the Author: Rosanne Parry is the author of the award winning novels Heart of a Shepherd, Second Fiddle, and Written in Stone. She has taught writing at schools, conferences, educational non-profits, and online at the Loft Literary Center. She and her husband live in an old farmhouse in Portland, Oregon where they are raising 4 children, 3 chickens and 5 kinds of fruit. She writes in a tree house in her back yard. Thank you so much for stopping by today, Rosanne. Readers, Rosanne has generously offered a signed paperback copy of Written in Stone. Leave a comment if you would like to be in the running. International entries welcome. What It's About (from the book jacket): When Larissa Renaud starts receiving eerie phone calls on a disconnected old phone in her family's antique shop, she knows she's in for a strange summer. A series of clues leads her to the muddy riverbank, where clouds of fireflies dance among the cypress knees and cattails each evening at twilight. The fireflies are beautiful and mysterious, and they take Larissa on a magical journey through time, where she learns the secrets about her family's tragic past--deadly, curse-ridden secrets that could endanger the future of her family as she knows it. And when her mother suddenly disappears, it becomes clear that it is up to Larissa to prevent history from repeating itself, and a fatal tragedy from striking the people she loves. Opening Lines: "The second day of summer was a flapjack-and-bacon morning with enough sweet cane syrup to make your teeth ache. A glorious, heavenly day when you got no more homework due for three whole months." 1) The cover: it is instantly appealing, with all that shimmery light. 2) I'm a sucker for time travel, and this one is done exceedingly well. The setting is in the bayou--and there's a gracious old house which, throughout the course of Larissa's travels, falls into disrepair. 3) It is totally spooky! First there's the creepy doll, then the mysterious phone calls from the antique, unconnected phone in the store. Then there's the tragic fire, and a visit to a graveyard. I was a wet rag at the end of this. 4) Larissa's character arc. I was impressed at her growth from the girl who is furiously resentful about her scar, and hates the girl she believes is responsible, to a person who realizes that there's many sides to a story, and who can embrace forgiveness. 5) The gorgeous writing. Kimberley Griffith's Little is a master of sensory details. I felt uplifted by the language on every page. I started out reading a whole lot of classics: Lois Lowry, Katherine Paterson, Louise Fitzhugh, Ellen Raskin, E.L. Konigsburg, Elizabeth Goudge – oh, and um, Nancy Drew. Like boxes full. That I saved for my daughters to read. Except I had 3 sons. Granddaughters, right!? As an adult I’ve loved Caroline Starr Rose, Barbara O’Connor, Nikki Loftin, Kathryn Fitzmaurice, Shannon Messenger, Jewell Parker Rhodes, Lisa Graff, to name just a few. There are so many fantastic writers, and most of that previous list of current favorites have become personal friends. Lucky me! Nonfiction: Ancient Middle Eastern war tactics (research for my YA trilogy with Harpercollins). Me: You certainly do read widely. I'm pretty much middle grade, with the occasional foray into The Game of Thrones--I'm reading Book 5 right now. Oh, I’d have to say all the creepy doll scenes, icy blue eyes watching Larissa across the antique store, batting her eyelashes and smiling when the curse from the Island of the Dolls unleashes its fury. The hair raised up on my own arms! I also love the heart-to-heart talk Larissa and Grandma Kat have about the family tragedies when Mamma goes missing—and then the doll goes missing . . .
Me: As I said above, that doll completely creeped me out! Good job! Making cookies! I make a lot of cookies during novel revision time and I now have the ability to go from empty mixing bowl to a plate of warm chocolate chip cookies in 20 minutes. Yeah, I’m awesome like that. Don’t forget the ice cold milk . . .
Me: I agree--those are special skills. Strawberry waffles and sausage, but I don’t eat it too often (usually it’s a yogurt, banana, and lots of ice water before I head out the door for my daily 3-mile walk). The older I get the more the weight hangs around making faces at me in the mirror each morning. I’ve always been a scaredy-cat when it comes to flying, but I just do a lot of praying and force myself to go because I love visiting new, exotic locales and seeing fascinating historical sites. Ever since I was very young I would try to imagine what it would be like to live somewhere or in a certain time period. My dream trip to the Middle East, Jordan, and Petra finally came true last year—and exceeded all expectations. Over the last decade I’ve stayed in a haunted castle tower room at Borthwick Castle in Scotland, sailed the Seine in Paris, walked the beaches of Normandy, stood at the place that Joan of Arc died, ridden a camel in Petra, saw the volcanoes at Kauai, shopped the Grand Bazaar in Istanbul, and spent the night in an old Communist hotel in Bulgaria. My next goal is Italy and/or Greece– and a cruise of some kind. I think I’m one of the only people I know who hasn’t been on a cruise at some point in their life! Me: Kimberley, that's a heck of a lot of traveling! Did you see a Scottish ghost? And yay: Italy. The Don's broken into song. But I have to say: I can join you in the never-been-on-a-cruise club. Thanks so much for being such a great guest. I loved your novel, and wish it and you every success. People, if you want to read something both lyrical and creepy, hie thee to a bookstore and get your mitts on THE TIME OF THE FIREFLIES! Kimberley Griffiths Little is the critically acclaimed author of several MG novels with Scholastic and an upcoming YA trilogy, FORBIDDEN, with Harpercollins in 2014. She has won the Southwest Book Award, the Whitney Award for Best Youth Novel of 2010, starred on the Bank Street College Best Books of 2011 & 2014, a Crystal Kit runner-up, and a New Mexico Book Award Finalist. Her books have sold several hundred thousand copies in the Scholastic Book Fairs and have been chosen for several state reading lists. She makes super cool book trailers and her first one for The Healing Spell garnered over 8,000 views despite the fact that she was/is a total unknown. Kimberley lives on a dirt road in a small town by the Rio Grande with her husband, a robotics engineer, and their three sons. 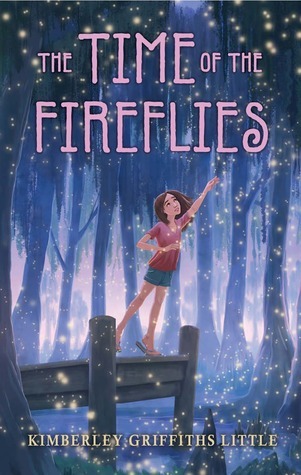 • Facebook: Find me at "Kimberley Griffiths Little"
Kimberley has very graciously offered a copy of THE TIME OF THE FIREFLIES for one lucky winner. All you have to do is comment, and the Don will pick a winner out of his hat next week. Till then, happy reading and writing. Ciao!